Our Tetsworth event was nearly two weeks ago but I haven’t had the chance to write about it until now, as I have been laid up in bed with this awful winter cold and a slightly broken body. But it was a fabulous night that repeated the success that we had in Ewelme so I wanted to tell you all about it. 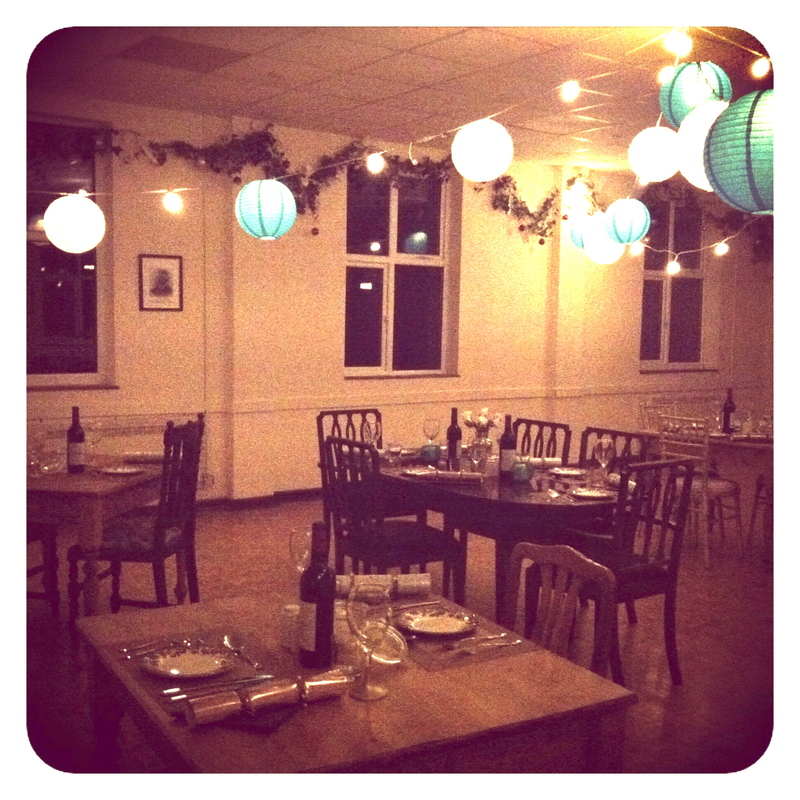 Ed and I worked tirelessly throughout the day to transform the village hall into a beautiful restaurant, Sarah who organises the bookings for the hall told me that the hall had never looked so beautiful! We were actually feeling a little bit smug at how well organised we had been for this event and it all seemed to be going a little too smoothly! One of the beauties/difficulties of working in village halls and different kitchens is that they all have their quirks. With Tetsworth this came in the form of an electricity meter that had to be fed with a pound coin! At 7:00pm, 30 minutes before our guests were due to arrive the pound got stuck in the meter!! We had no idea how much electricity we had left or how long it would last. Visions of our guests being plunged into darkness mid mouthful flowed through my head. 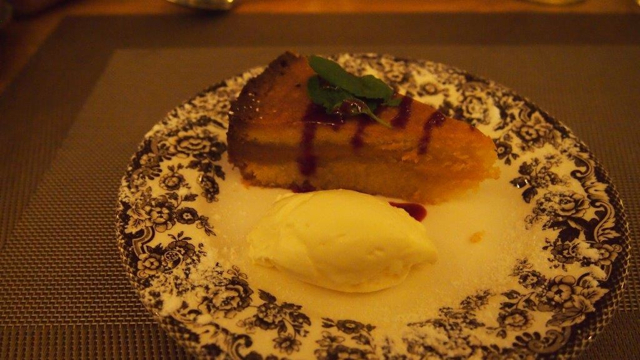 Sticky almond cake, a firm favourite with our guests. A slightly frantic phone call to Sarah later and her husband, Steve, was on the way. I have to say that Steve became our knight in shining armour that evening and he managed to dislodge the pound coin with a knife. We were back on track, phew that was a close one. After coingate things went swimmingly, our guests arrived, they ate and enjoyed the atmosphere. 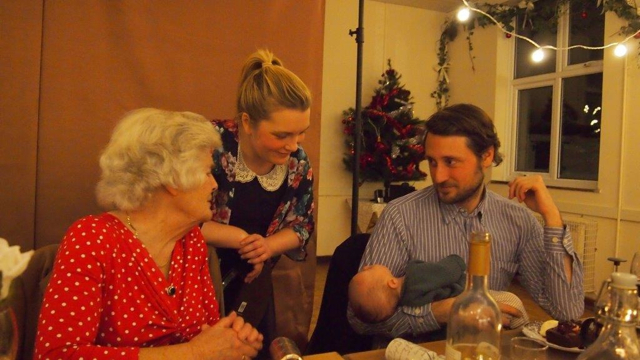 It was lovely for Ed and I as our families attended the event, including my tiny weeny new two month old nephew, Eliot. We wanted to share with our families what we have achieved as they have been with us every step of the way. There is no better way to tell people thank you, than cooking them a good hearty meal. It’s a family affair me, my Grandma, my sister’s partner and baby Eliot. 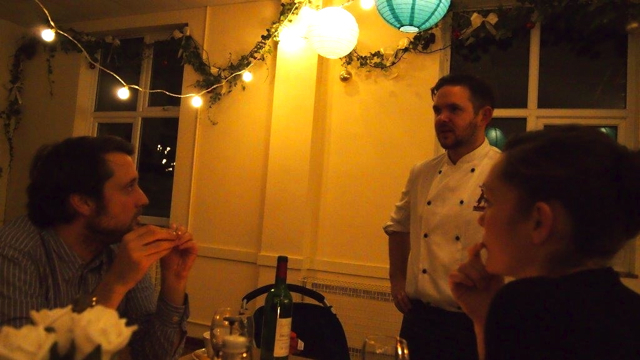 What a wonderful year 2013 has been for The Wandering Kitchen, from pie in the sky idea to fully fledged business. Ed and I just want to thank everyone for supporting our new venture and say watch this space for what events we have planned for 2014. You babes are awesome, stunning idea. Keep smiling. 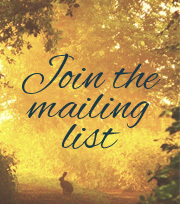 We would love to come to one of Wandering Kitchens events, keep us posted. Have a fabulous Christmas, cheers to 2014.